Mark Twain was born Samuel Langhorne Clemens in Florida, Missouri in November of 1835. He was the sixth child born to John Marshall Clemens and Jane Clemens. Of the seven children born into the Clemens family only three survived past childhood. As a child Twain’s family moved to Hannibal, Missouri. It was a small port town that would later serve as the inspiration for the town of St. Petersburg in Twain’s novels, The Adventures of Tom Sawyer and the Adventures of Huckleberry Finn. Twain’s father died when the boy was just eleven ears old. It was around this time that he left school in order to become the apprentice to a printer. This apprenticeship resulted in his working as a typesetter for the Hannibal Journal. His role at the paper also helped with his publishing of articles and sketches within its pages. When he turned 18 he left Missouri to work as a printer in a number of other cities. These included New York, Philadelphia and Cincinnati. Since he did not get to finish his education, he spent a great deal of time at public libraries. This allowed him to acquire a broader perspective not offered in his rural home. Although Twain was writing during this period it was without ambition. In 1855, Twain moved to Keokuk, Iowa where he worked for his brother’s new print shop. He became a partner for approximately a year before moving back to Cincinnati. A year later he decided to travel via steamboat to New Orleans. It had been his goal to travel onward to South America in an attempt to make his fortune. This did not come to pass. Instead he convinced the captain of the ship to take him on as an apprentice. Twain later cited his days learning how to pilot a ship as being some of his best. He relished the freedom the river provided and the respect with which he was regarded. Twain received his pilot’s license in 1859. Over the following years of his piloting career he fell in love and accidentally played a part in the death of his brother. Twain secured a job fo this younger brother Henry on a riverboat on which the boiler exploded, fatally injuring him. These years also saw Twain write a few, mostly comical pieces. One of these was River Intelligence. It was written in 1859 and detailed the life a riverboat pilot named Isaiah Sellers. Two years after receiving his riverboat licence he left the profession. This was mainly due to the outbreak of the Civil War. The details of this period were recalled in The Private History of the Campaign That Failed, published many years later in 1885. In an effort to find new employment Twain petitioned the Territorial Enterprise for work. Twain was offered a job as a reporter in Nevada. It was in 1863 that something written by “Mark Twain” first surfaced. It was a report on the legislative session in Carson City. This period saw a few of Twain’s sketches and articles appearing in New York. His reputation was slowly growing. He went on to become a correspondent, then a full-time reporter, for the San Francisco Morning Call. He soon began writing pieces for the Californian, a literary magazine. This was work he found to be much more interesting. These were the years that confirmed to Twain that he was meant to be a writer. He wrote for a number of other newspapers and traveled to Hawaii. Then, he began a lecture tour throughout the Hawaiian islands. This endeavour was a success but not something he enjoyed. His first book was finally published in 1867 and was titled The Celebrated Jumping Frog of Calaveras and Other Sketches. His first real successful book was The Innocents Abroad. It detailed his own trip to Europe and the Holy Land. On this trip he met his future wife Olivia Langdon. In 1873 Twain moved his wife and children to Hartford, Connecticut where he had been planning the construction of a new home. Twain lived there for seventeen years and wrote the majority of his better known works. These included The Adventures of Tom Sawyer published in 1876, The Prince and the Pauper published in 1881 and Adventures of Huckleberry Finn published in 1885. Twain’s wife Olivia died in 1904, thirty-four years after they were married. The last years of Twain’s life were spent in Manhattan where he was in a deep depression. His daughter Suzy had died of meningitis in 1896, followed by the death of his wife and youngest daughter Jean. 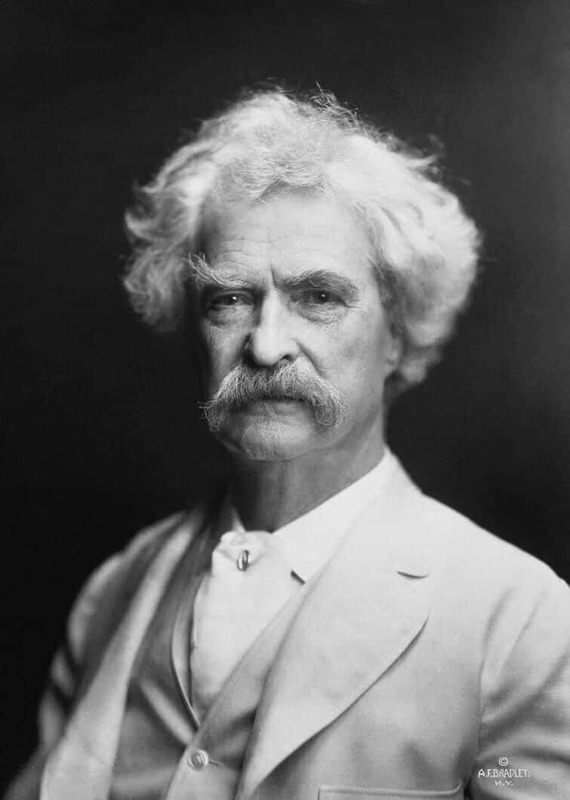 Twain suffered a heart attack and died on April 21, 1910. He was buried alongside his wife at Woodlawn Cemetery in Elmira, New York.